Rub orange juice concentrate over all sides of pork roast; sprinkle with 1 tablespoon Cajun seasoning. 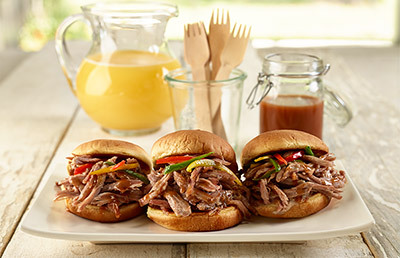 Place pork in 3- to 4-quart slow cooker. Cover and cook on Low 10 to 12 hours (High: 5 to 6 hours). Remove roast from slow cooker; pull or shred using two forks, discard fat. Whisk together orange juice, barbecue sauce, honey, mustard, cornstarch and remaining 1 tablespoon Cajun seasoning in small saucepan. Heat to boiling; simmer 10 minutes. Remove from heat and store, covered, in refrigerator until needed. Stir desired amount of Cajun BBQ Sauce into pulled pork or serve it on the side.